In the past 40 years there have been a number of significant developments across the fields of educational administration and history. In this volume, the authors have selected a number of key issues to illustrate and trace these changes. The seven articles by leading scholars in the field offer an analysis of contemporary educational administration, history and policy debates and how this has impacted on teachers, leaders, schools and the education sector. This book offers readers a valuable insight into continuing and contemporary debates in the field and the authors offer a refreshing interpretation of these debates. This book provides a rich analysis from a range of theoretical, methodological perspectives and highlights the extent to which these debates remain a contemporary concern. This book was published as a special issue of the Journal of Educational Administration and History. Tanya Fitzgerald is Professor of Education at Unitec Institute of Technology, Auckland, New Zealand. Tanya has an extensive publishing record on the history of women’s education, gender, leadership and ethnicity, and teachers’ work. 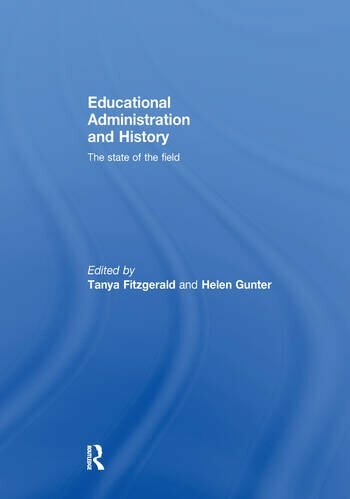 As well as co-editor of the Journal of Educational Administration and History, Tanya is executive editor of History of Education Review and the New Zealand Journal of Educational Leadership. Her forthcoming book is a study of women professors at the University of New Zealand 1911-1961. Helen Gunter is Professor of Education Policy, Leadership and Management in the School of Education, University of Manchester, UK. Helen’s research interests focus on the history of the field, with a particular interest in knowledge production through theorising, research and practice. She has published five books and over 70 papers, and is currently co-editor of the Journal of Educational Administration and History.